If you own a home or business in Chandler, Arizona or any of the surrounding areas you are probably not a stranger to scorpions. With a fierce look to them, these eight legged critters have pincers at the front of their bodies and a segmented tail with a stinger at the end which is used to kill their prey or sting the misplaced bare foot! So, if you are like many people that want to run away screaming when you find one, your reaction is quite valid. Many scorpions do not have life-threatening stings but there is one type of scorpion right here in Arizona that poses a threat to humans and animals. Our descriptions below can help you identify the types of scorpions most commonly found in Chandler and what to do if you find one! Watch out for these scorpions! 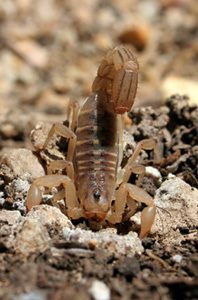 Bark scorpions are not only the most venomous scorpion found in Arizona but in the whole United States! Unfortunately, bark scorpions are very common in Chandler. They are not big, usually only about 2 inches long and have a thin body and tail. Bark scorpions are yellow to brownish in color which makes them hard to see and avoid because they find their way into small, dark places like shoes and mattresses. These scorpions are also very good at climbing, which makes their threat even more significant as they have literally dropped from the ceiling and stung people! We always say a good defense is prevention so check here for tips to avoid a scorpion infestation. If you are stung or wake up in the night with tingling, numbness or localized pain try to carefully capture or take a picture of the scorpion if you can find it. Then call Poison Control or head to the emergency room to be sure your symptoms don’t become life threatening. The good news is that there is anti-venom and in the last 20 years, tracking by the University of Arizona has shown no deaths have occurred as a result of reported scorpion stings! This is the most common scorpion found in Arizona. They have a medium-sized body and a thick, sturdy tail with dark ridges running along the entire underside of their body which is usually about 2-3 inches long. Commonly found under rocks, these scorpions are like all others in that they hunt only at night and like to stay in cool, moist areas during the day. Luckily, their venom is not life-threatening to humans but we would still avoid contact by not overturning rocks on a hike and wearing gloves when gardening and turning over soil. If you do come across multiple scorpions in your home you may have a scorpion infestation which can be tricky to get rid of because these creatures are so hearty. Professional pest control companies are equipped with knowledge and higher grade insecticides to take care of scorpion problems so be sure to call them if you are seeing multiple scorpions indoors or out. These are not as commonly found as the striped tail or bark scorpion but can look really creepy. Desert hairy scorpions can be quite large, measuring up to 6 inches and they get their name from the little brown hairs that cover their bodies. Because of their size, they feed on larger insects or even lizards and other scorpions! If stung, it has been reported that the stinging sensation is mild and results in minor, local swelling at the site of the sting. There are some brave souls out there that actually have kept this type of scorpion as a pet! But we don’t recommend having pets that, if they accidentally get out, could sting you or your loved ones. As always, allergic reactions to any scorpion sting have happened so if you have excessive swelling, a lot of pain or any trouble breathing you need to seek medical attention immediately! Hopefully this information hasn’t creeped you out too much and will help you in the event that you run across a scorpion. We are glad to help answer your scorpion questions and if you do unfortunately find one, our professionals can identify what type of scorpion you are dealing with and the best methods to take care of any scorpion infestation. Feel free to call us anytime!